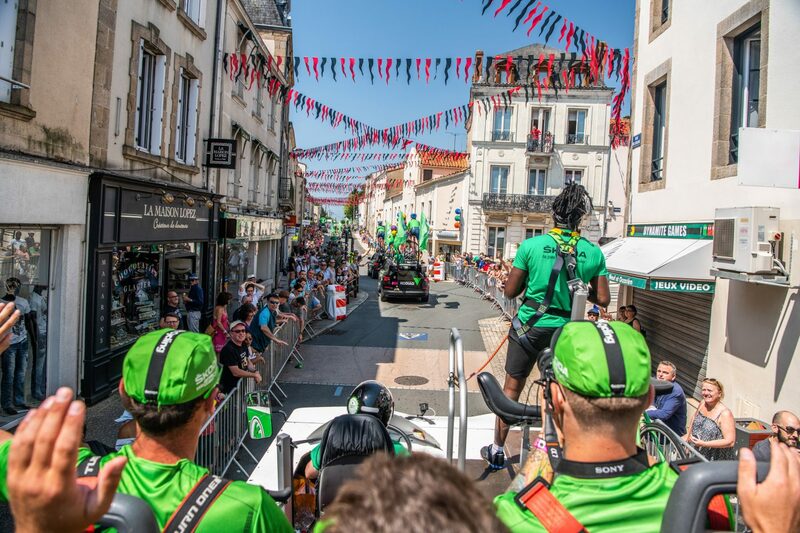 Each stage of the Tour de France is headed up by a 12-kilometre caravan of race partners, all with one simple goal: to whip the audience into a fervour along the track with millions of presents and a great show. The entire caravan consists of 160 to 170 vehicles lining up to promote the various commercial partners of the world’s most famous cycling race. 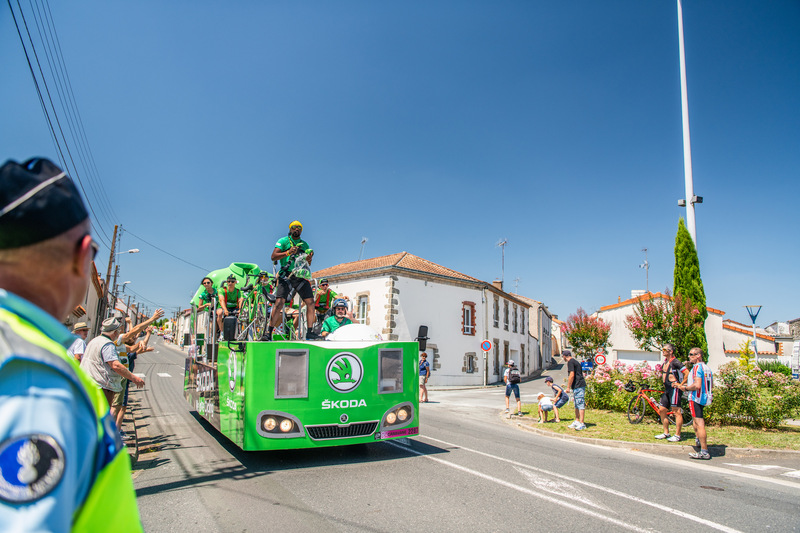 This huge caravan can stretch to up to 12 kilometres in length and runs through a stage at roughly the same speed as the cyclists, so it can easily be on the track for more than four hours. A bit of a circus on wheels, it always sets off exactly two hours before the start of the race. The goal, of course, is to grab spectators’ attention. 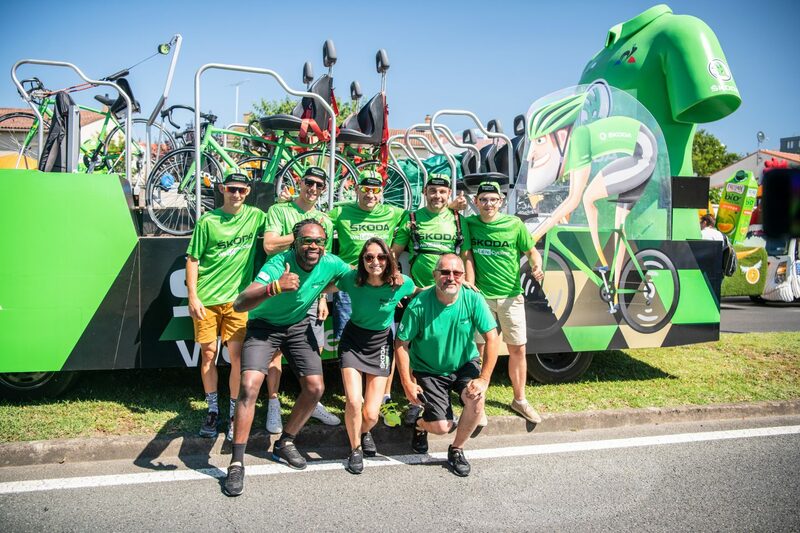 This means that the caravan includes, for example, enormous figures of cyclists in the ŠKODA livery as well as a gigantic version of the green jersey for the best sprinter. Other parts of the caravan feature stuffed lions, giant plastic oranges, cakes looking like flying saucers on wheels, deep fryers stuffed with chips, chickens, and even mobile homes. Setting such a behemoth into motion is no easy task. The preparations and the actual caravan ride involve roughly 600 people, all of whom start preparing for each stage almost two hours before the scheduled start time. In a large car park near the start of each stage, all the crews work out the finishing touches, load up thousands of presents, test the music soundtracks, and fine-tune the choreography of their MCs and dancers. At the start of each stage, the caravan is divided into smaller groups based on the brands being promoted. These teams keep their distance from one other so that the spectators can properly focus on each show as it comes by. 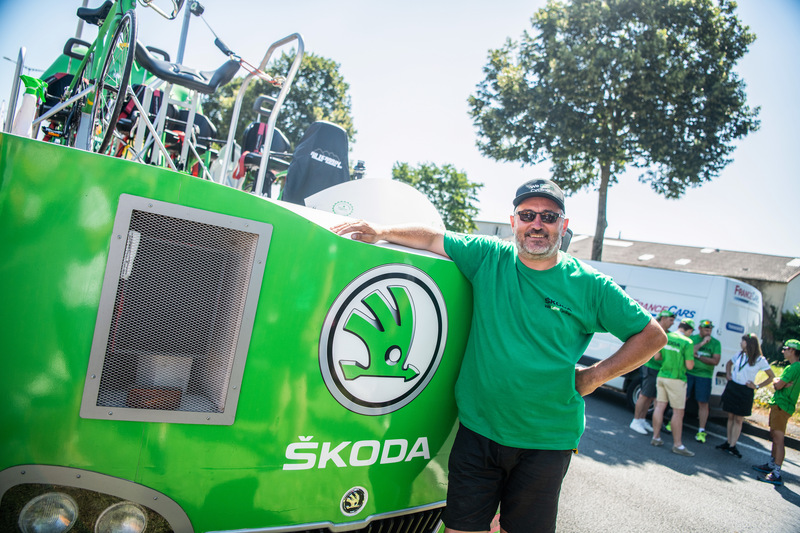 The main star of the ŠKODA part of the caravan is a completely rebuilt truck with a fully open top and a massive green jersey for the winner of the Tour’s sprinter classification. The crew consists of a driver and an MC, whose job is to get the crowds of fans excited along each stage. In the back seats, invited VIP guests get to enjoy a truly unusual ride. The whole group is accompanied by a hostess, who tries to give out as many gifts as possible along the way, handing out thousands of green jerseys and cycling caps. 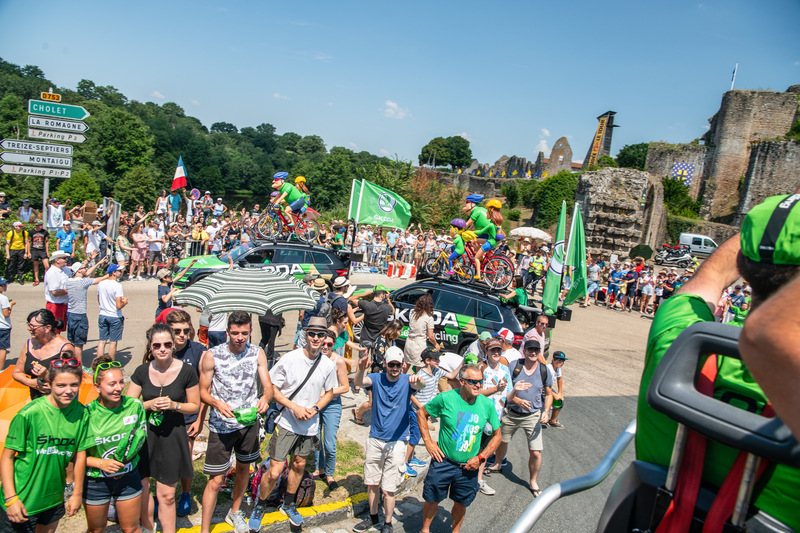 Besides the float, five KODIAQ and KAROQ cars plough along the stages of the Tour de France, carrying on their roofs laughing figures of cyclists made famous by the website WeLoveCycling.com. The rear sections of all five accompanying SUVs are heavily modified so that another team member can pass out gifts to those lining the route. Every day, the team gives out more than 30,000 caps and jerseys to spectators, distributing over 600,000 gifts to fans throughout the entire Tour. Over the three weeks of the Tour de France, the entire caravan hands out an unbelievable 14 million gifts! 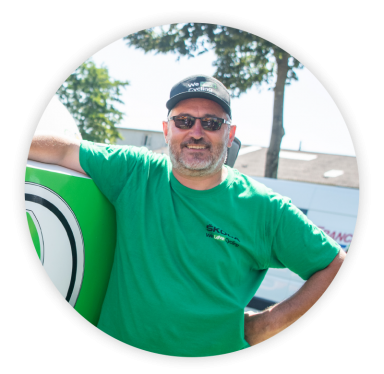 Riding in the caravan is a fantastic experience, especially in an open truck. You can see the route of the stage in front of you, you feel the energy of the spectators on both sides of the road, and you imagine what it must be like to be in the peloton at full racing speed. The biggest rush, though, is undoubtedly the interaction with the fans along the route. People applauding, waving, and in the few seconds it takes to pass them there might even be a quick dance with the MC standing beside the truck driver. Otis the MC is on a roll – exchanging quick greetings, singing with people, dancing, and even getting a Mexican wave going on both sides of the road in front of the caravan. In the meantime, you can see kids and adults with happy eyes putting on the caps and green jerseys that they just got from the hostess in the car in front of you. People get really fired up about the caravan and have a great time, as you can see in the video in this article. A survey from last year showed that 47% of the audience came to see the Tour de France because of the caravan. The idea behind creating the caravan was born 88 years ago by the founder of the Tour de France, Henri Desgrange himself, who wanted the racing teams to represent their countries, not commercial brands. All the partners of Tour de France then gathered into a long caravan moving along the same route ahead of the peloton. The idea of national teams didn’t catch on right away, but the caravan was an immediate hit among the fans. For the more than 80 years of its existence, it has become a phenomenon that’s just as much a part of the Tour de France as the cyclists are. The same applies to ŠKODA, which has been a race sponsor since 2004. 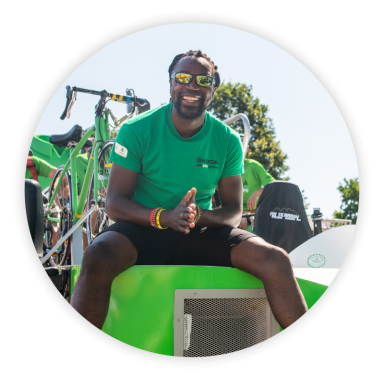 My job is to make sure that the fans enjoy the association between the Tour de France and the ŠKODA brand. What’s your role in the caravan? There are several roles, in fact. Most of all, it’s clearly about entertaining. I encourage a great atmosphere among fans along the route and promote the partnership between the two brands. 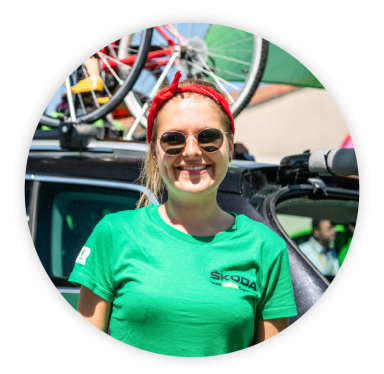 ŠKODA has been a Tour partner for years, and it also sponsors the green jersey competition for the best sprinter. I want to motivate the crowds along the track to cheer on the sprinters. I also point out to our guests in the vehicle how beautiful France is, and occasionally I help Jean-Marc, the driver, to make his way through the crowds safely. Can you feel the energy of the crowds of fans along the track? Absolutely. The Tour de France stages attract millions of fans every year, and I draw on their energy for my performance. It’s a source of inspiration for me. Do you prepare your performance in detail beforehand, or do you prefer to improvise? I have a basic outline of each stage, where I react to the basic landmarks along the way. But most of the time I improvise, because we have different guests in the car every day and the fans around the track also change. I need to respond to that. You could say that the ŠKODA caravan has a different MC every day. This is the kind of variety that I enjoy. How do you enjoy the caravan ride? I’ve been in charge of the Tour de France caravan for four years. The more I understand the Tour de France and the ŠKODA brand, the better I’m able to work. It’s a great adventure, and I really enjoy it and everything that it entails. Driving our promo car is just like driving a truck, except that I have to wear a helmet. How many kilometres do you drive throughout the entire Tour de France? The accompanying cars ahead of me each drive about 11,000 kilometres, because they move between stages on their own. The big promo car, though, gets loaded onto a lorry. The number of kilometres I drive is the same as the distance that the cyclists race, which is roughly 3,500 kilometres. Are there any factors specific to driving a promo car? Nothing special. The car is built on the chassis of a 3.5-tonne truck and is very similar to drive. However, I have to be careful of the vehicle crew distributing the gifts and, most of all, the fans. I have to drive close enough to the spectators so our gifts can get to them. At the same time, I have to pay attention to the situation in front of me, because some spectators get into the road when collecting promo gifts from the caravan ahead of us and that can be quite dangerous. What are your speed limits? We can never go faster than 80 km/h, but we maintain an average of 40 km/h on the track. On the way from the car park to the start, or from the finish line to the car park, we’re limited to 30 km/h. Even though we’re just passing by, I see how the people are happy for each gift! How many gifts do you hand out during each stage? During a stage, I toss out around 5,500 caps and jerseys. Are there any rules you must keep to when you throw gifts to the spectators? Yes, there are. We’re not allowed to throw the gifts too high, otherwise we might hurt someone. We also have to be careful not to let gifts remain on the road surface, otherwise people might get in the way of other caravan cars when they pick them up. Do you have time to see the responses when they get the gifts? Yes I do, and that’s what I enjoy most about the caravan. It really makes me happy to see the joy they get with each gift that passes through my hands. 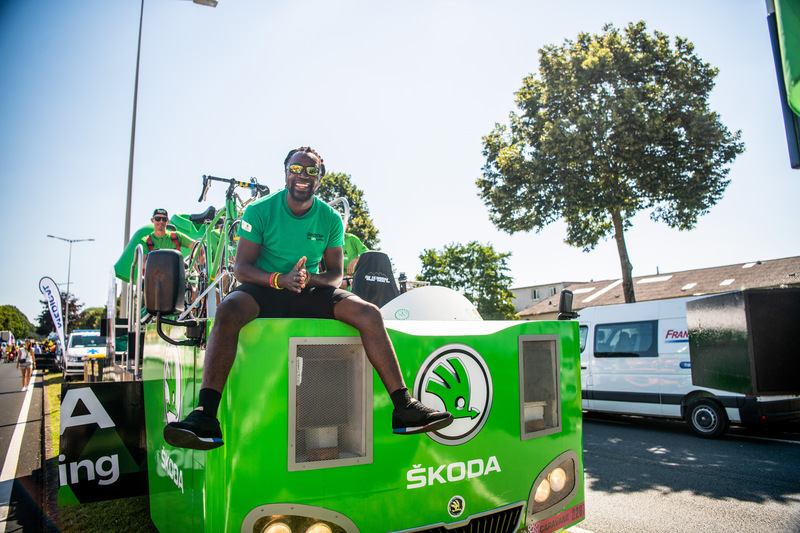 This is carmaker ŠKODA’s 15th year as the general sponsor of the Tour de France, the legendary annual cycling race. Besides laying on a large fleet of cars, ŠKODA also designs the winners’ trophies. This year, the designers have teamed up with Bohemian glassmakers to produce 60 cm tall trophies weighing in at 4 kg for the champions of the 105th Tour de France. In the 2018 event, the racers have to surmount 3,351 extremely tough kilometres over 21 stages. ŠKODA, as an official partner, will supply 250 cars for the race. In addition to ŠKODA OCTAVIAs, the fleet also includes the SUVs ŠKODA KAROQ and KODIAQ and the ŠKODA SUPERB sedan. A ŠKODA service team will prep all the cars so that they are in perfect condition before each stage. ready to assist any cyclist in trouble, with mechanics able to help in case of a breakdown or provide a replacement bike or refreshments. each team will have two cars following the peloton. The order of these vehicles depends where the team’s leading cyclist is positioned in the field of racers. race organisers’ vehicles used to transport VIP guests and journalists, giving them a front-row seat to enjoy the atmosphere of the Tour de France.